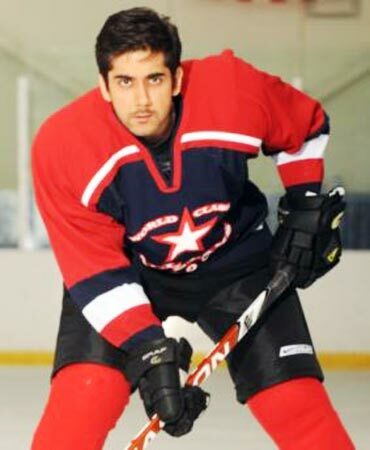 Rediff.com » Movies » Akshay Kumar's next: A sikh who loves ice hockey! Akshay Kumar's next: A sikh who loves ice hockey! Akshay Kumar, who is producing his first international film Breakaway, has assembled an interesting cast -- led by ice hockey player Vinay Virmani. The film is currently being shot in Toronto. Breakaway is your first international project. How involved are you in it? It's a cross-cultural, emotional comedy with a huge heart. I am one of the producers and also the lead presenter of the film through my company Hari Om Entertainment. It tells the story of a group of young Indo-Canadians who although spurned by the largely Anglo hockey community, have the dream of being a competitive team in the big tournament. The film gives a peek into the culture and lifestyle of the Sikh community while providing plenty of action and laughs... I gave a fair bit of inputs for the script. What role does ice hockey play in the film? Ice hockey is Canada's national passion; Canadians treat it like religion. And field hockey is in our (Indian) blood. So this is a great combination. Ice hockey forms the back drop of the film. Who conceived this idea and when? This idea was conceived almost three years ago by Vinay Virmani, who wrote and developed the story. It is a story that I immediately felt passionate about. Why did you choose Vinay as the lead star? I have known Vinay since he was 8 years old; he grew up in front of my eyes. He is my little brother. He is a talented ice hockey player and truly passionate about writing and acting. He is an extremely passionate young man and a talented actor. You have assembled a truly international cast. How did you manage to bring them on board? Yes, we have worked hard with our cast and have been able to assemble a dream cast. We have Russell Peters (the stand-up comedian), Camilla Belle (10,000 BC), Rob Lowe (Brothers and Sisters), Anupam Kher, Gurpreet Ghuggi (Punjabi actor/comedian), Noureen DeWulf (Ghosts Of Girlfriends Past) and Sakina Jaffrey (daughter of actors Saeed and Madhur Jaffrey). We are fortunate to have such an admirable and talented team. Everyone we approached loved the concept and our vision; they connected with script. The rest was easy. What about your director Robert Lieberman? Lieberman has directed films like Mighy Ducks 3, Table For Five and many others. I met him in Canada during one of my shoots. We instantly connected and shared the same vision. He is brilliant. Tell us about your producing partners. I call it a dream team of producers. I have Ajay Virmani (First Take Entertainment), Frank Siracusa and Paul Gross (Whizbang Films), Andre Rouleau (Caramel Films) and Don Carmody (Don Carmody Productions) as my producing partners. Since the project is very vast it helps to have producing partners with such depth of experience to draw upon. What is the film's budget? Who are the other financial partners? It's expensive! I want to acknowledge the support of Telefilm Canada, CBC Televison and our Canadian distributor alliance. They have been great about making this dream project a reality. Your movies always have great music. What about this film? We will not disappoint the public. Stay tuned. The message in Breakaway is for our youth: You never have to give up your identity, culture and family values to achieve your dream. We shoot for about seven weeks and finish in the first week of November. Then we will go to post production for four months and are looking to have a worldwide release in the fall of 2011. We are hoping to get selected to premiere at the Toronto International Film Festival in September 2011. You were recently appointed ambassador of Canadian Tourism. 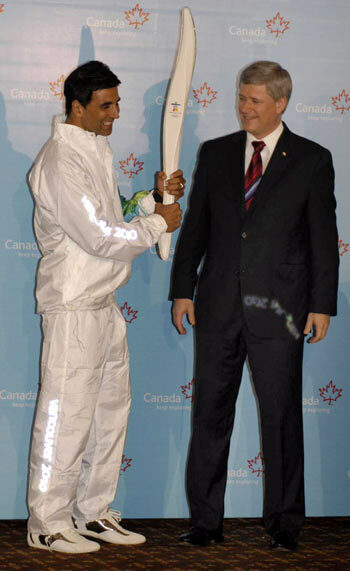 You carried the Olympic torch and hosted Prime Minister Stephen Harper's state dinner for his Indian counterpart Dr Manmohan Singh. What next? I love Canada. It's my second home. I am sincerely appreciative and thankful for the support I receive from Canadians and their government. The warmth of the people is unique. I am looking forward to many more great things in and with Canada. The Harper government has just finalised a film co-production treaty with the Indian government and this will mean great opportunities.